Amman is a city of about 4 million. Despite the large population and its sprawling hills, I rarely go a day without interacting with someone I have crossed paths with before. Whether it is the young man selling figs on a Friday morning by Al-Fayhaa Mosque, a former classmate reading in a cozy coffee shop, or earnest cab driver who has picked me up before and remembers where I work, there are always familiar faces. These daily encounters are slowly allowing me to build a sense of comfort and belonging in Amman. Beyond these serendipitous meetings, joining athletic groups in Amman has been a rewarding way to meet people, make friends, and find community. Weekends in Jordan start on Friday. The mornings are quiet and peaceful. I meet the Running Amman group every Friday morning to run on empty streets with 20 to 40 others. We end each run with brunch in the neighborhood. 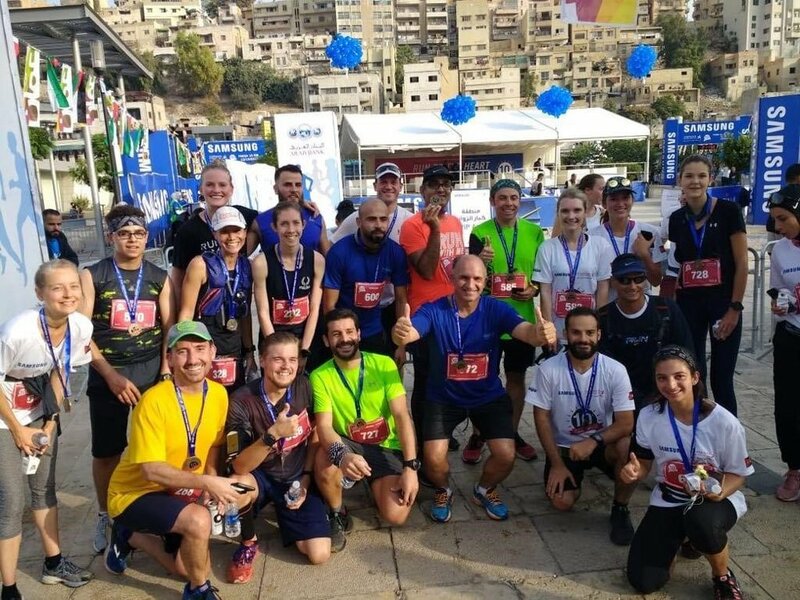 This past weekend, at least 20 from the group completed the Amman half marathon, full marathon, or 10k. Sharing congrats and welcoming each runner at the finish line reminded me of how supportive and friendly runners’ groups are. I seek out a running community wherever I am, and I am happy to have found it in Amman. I go to a women-only gym in Al-Rabieh. I feel welcome thanks to the mothers that invite me to drink coffee before their 7:00 am workouts. I am grateful for the space in which I feel comfortable as female. Public spaces in Jordan are male-dominated spaces, and I am honestly relieved by the lack of men when I go to the gym. Ladies’ gyms are where women don’t think twice about exposed hair, elbows, shoulders, or bellies, celebrate birthdays in the locker rooms, get their nails and hair done at the adjoined salon, and spend time walking and gossiping side by side on treadmills. It is a safe space where I have made female friends 18 to 65 years old.